Styx of Stroud is a mixed Border Morris side founded in 2012 to perform traditional and contemporary dances in the Border style. We wear tattercoats, predominantly black, but with flashes of red and green to reflect the felt-making heritage of our home town of Stroud in Gloucestershire. Our faces are blackened to honour the original Border dancers who would blacken their faces with soot as a disguise to avoid prosecution for begging. And our kit is a mix of corsets, boots, a bit of steampunk, bells and top hats with feathers. During the summer months we regularly dance out in public, but from September through to the end of April we practise each week, usually on a Thursday but occasionally on Tuesday if we get bumped out of our practice space. 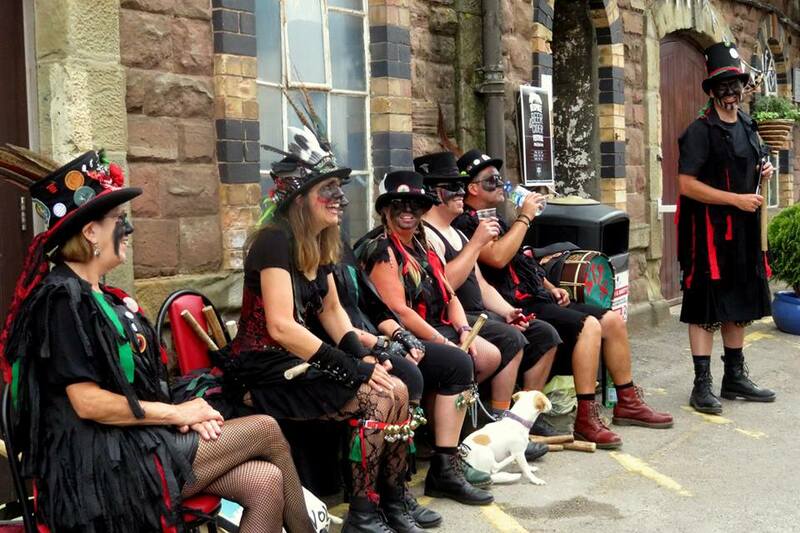 If you’d like to give Border Morris a go yourself, book us for a function, or just come to see us perform, please contact us.